Digging into a massive unofficial expansion pack. 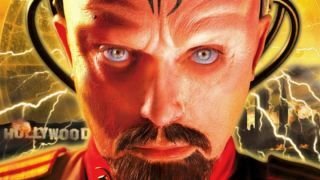 From humble beginnings—first releasing in 2005 as a balance mod—Mental Omega has grown and expanded over the years to become what its creators call an “unofficial expansion pack” for Red Alert 2: Yuri’s Revenge. It’s hard to argue with their assessment. This is a massive mod that not only expands the conflict with new factions and units, but, as of writing, features a campaign with over 70 missions – with more on the way. Quantity isn’t a great indicator of a mod’s success, but the missions I’ve sampled so far have all been well made. More than just a sequence of skirmishes, most offer specific, custom objectives—some more inventive than those found in Westwood’s original. Take the first Allied mission of the mod’s first act, which is a retelling of Red Alert 2’s central conflict. In the original game, you clear Liberty Island of Soviet troops, and then fend off an attack from paratroopers. It’s a gentle, small-scale introduction, elevated by the use of a famous landmark, and by Premier Romanov actor Nicholas Worth’s attempt at a Russian accent. “Gentle” isn’t in Mental Omega’s vocabulary. Its first mission is a full-scale Soviet invasion of Washington DC. Rather than let you build up a base, you’re handed control of a platoon of soldiers. Your job in the opening minutes is to decide where to place them in preparation for the onslaught. Garrisoning units in civilian buildings—a neat but often underserved feature of Red Alert 2—is crucial, helping you extend the range and defence of your precious soldiers. It’s not flashy—there are no actors chewing their way through an FMV cutscene—but there’s enough drama to be found in the scenario itself. Even this first mission doesn’t pull its punches, and that’s just playing on normal difficulty. The Soviet force is unrelenting, and the attack comes on multiple fronts. Overall, the missions are more micromanagement heavy than a vanilla C&C campaign, by which I mean I failed them a lot. If I’ve one complaint it’s that a few too many missions start with just a handful of units, severely punishing small mistakes. Still, you can select every mission from the start, letting you skip past any difficulty spikes you encounter. Or you can watch each mission’s linked walkthrough video, and instead enjoy success vicariously. The main draw of Mental Omega is the chance to run through a campaign as Yuri’s Epsilon Army. Despite being the antagonist of Yuri’s Revenge, the psychic mastermind’s force was only playable in skirmish mode. Here you work in secret, using the mind control powers of your PsiCorps to undermine both the Allies and Soviets. More than in the other campaigns, the often small squad size you start with makes sense. It’s always fun to infiltrate an enemy base, using just a handful of Adepts to wreak havoc as they mind control whoever comes near. Just beware of dogs, the vacuous nemesis of the psychic warrior. A fourth faction, The Foehn Revolt, doesn’t yet feature heavily in the campaign—currently offering just three missions, with more planned in future updates. But they’re fully playable in skirmishes, and prove a dominating force thanks to nanotechnology. They’re a fun addition: expensive but powerful, and with some fun special abilities, such as the nanofiber sync that transforms and upgrades units within its radius. Skirmish mode remains a great way to learn each faction’s quirks. Not only does each side have more units than in the base game, but the subfactions have been fleshed out, too. More than just a unique unit, each subfaction offers a specific style of play. The Epsilon Army’s Scorpion Cell, for instance, lets you quickly expand your army with cheap, basic units—a useful counterpoint to The Foehn Revolt’s costly tech. If there’s a downside, it’s that there’s no explanation of each unit in the mod itself. “Yes,” you’ll think. “I will build a Zorbtrotter,” silently praying that they’re in any way useful. Unlike Twisted Insurrection, Mental Omega isn’t a standalone mod. To play it, you’ll need to install a copy of Red Alert 2: Yuri’s Revenge, make sure it’s patched to the latest version, and then follow the instructions on the mod’s website—copying a selection of files to a new folder, and extracting the mod into that. Fortunately, it runs better than the creaky Red Alert 2, but I still found the default renderer struggled at high resolutions. On my machine, switching to TS-DDRAW in the display options led to the best results. It’s worth taking the time to get it up and running. Mental Omega is a dramatic expansion that’s still being worked on. And even if you do somehow finish its many campaigns, it also features challenge modes, co-op missions and a small but active online community. Its 13 years of iteration and development haven’t gone to waste. If you’re a fan of Red Alert 2, this is the mod you need.